A couple of weeks ago, I realized that it was nearly April and that I had yet to start on my Christmas cards. Since I need more than 50 each year, I try to do one per week at a minimum. Then two of my blogging buddies each posted Christmas cards they had done and I got a jolt of inspiration. Four days ago, I was talking to a friend in Arizona, who told me she had been stamping and printing Christmas images in order to start on her cards for this year. Sigh, I still hadn't started. Today, when I checked my mail box, she had sent me a dozen Christmas images, each completely adorable and waiting to be colored. What a wonderful surprize! I immediately colored three of them and used the first one to make a card. So, here it is -- my first Christmas card this year! How perfect is this given the fact of my granddaughter's competitive Cheer team having been invited to the national finals in Florida? :-D It's either that or this is what reindeer do in the off season to stay in shape for that long and sometimes arduous Christmas Eve journey. I'd love to tell you where to get this image but unfortunately, when Sherryl sent me the images, she didn't include any information about the artists or the digi/stamp companies so I can't tell you who made this one. I used my ProMarkers to color it, then cut it into a rectangle and matted it. Can you believe I cut it with my paper cutter and didn't use any dies on this card? Good grief, you may not believe that I'm the one who made it! I added two different ribbons from my stash, (one red and white, the other sparkly silver) wrapping them around a piece of kraft CS and then added the image on top, canting it at an angle. I used one of the tiny bows I make up by the dozens and toss into my stash for future use, first dying it red with a marker. A fabulous card and I love the fun image. Thank you for sharing with us at Winter Wonderland. This is just too cute Connie, love the reindeers. I have been so naughty and not done any Christmas cards yet! Need to get my self sorted and make a start or it is going to be last minute. LOL. What a fantastic image, how lovely of your friend to send it to you! Your colouring is beautiful, love the simple design with the ribbon and twine. A great start to your 2017 Christmas cards! Thanks for playing along with us at Sweet Stampin' Christmas Challenge, hope to see you again soon. What a perfect image for you with the cheer leader finals. Love the colouring and beautifully put together. This is absolutely perfect for your granddaughter and her upcoming competition! 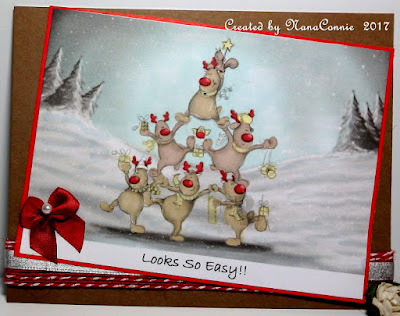 CUTE image and I just love your card Connie Their pyramid does look easy - but know it's not by any means! A wonderful card so beautifully crafted. It really made me smile. Totally wonderful and fun Christmas card. Loving the ribbon, bow and twine. Love the color combination, my favorite, and of course the deer are cute! Thank you for joining us at Addicted to Stamps and More!